In a deal with the Finance Ministry, the Defense Ministry will get a billion shekels to evacuate Tel Aviv's Sde Dov Airport by 2017. 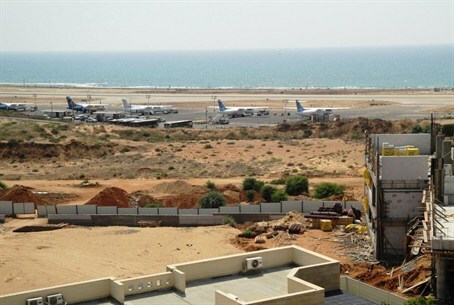 Tel Aviv's Sde Dov Airport will be closed sooner than expected. In a deal with the Finance Ministry, the Defense Ministry, which owns the land, will receive NIS 1 billion ($355 million) to vacate the space by 2017. Part of the money will be paid out this year, helping the Defense Ministry to partially allay its budget shortfall. The sale of Sde Dov is part of a “retreat” by the IDF and Defense Ministry from the Tel Aviv area. According to experts, the IDF is sitting on some very valuable real estate in the center of the country – worth as much as NIS 90 billion. Real estate developers have long sought the valuable parcels. The first 20 dunams of land in the airport will be evacuated this year. Overall, plans have been drawn up for some 16,000 housing units to be built on the vacated space. The Defense Ministry earlier this year said that it had a severe budget shortfall. The Israel Air Force temporarily cut training flights, over complaints that the Finance Ministry had refused to increase the defense budget as needed. Finance Minister Yair Lapid has called to slash the defense budget and use the money to improve social services. Last October, it was decided to transfer 2.75 billion shekels from the budget surplus to defense, after the defense establishment asked for an increase in its budget following a series of streamlining steps.